"We now have concrete evidence that the Trans-Pacific Partnership threatens our families, our communities, and our environment. It's no surprise that the deal is rife with polluter giveaways that would undermine decades of environmental progress, threaten our climate, and fail to adequately protect wildlife because big polluters helped write the deal. "The words 'climate change' don't even appear in the text, a dead giveaway that this isn't a 21st-century trade deal. It sets us back further, empowering fossil fuel corporations to challenge our public health and climate safeguards in unaccountable trade tribunals while increasing dirty fossil fuel exports and fracking. "Many provisions in the deal's environment chapter are toothless and fail to offer any of the protections proponents of this deal have touted. Some provisions even fail to meet the minimum standards of environmental protection established in the 'fast-track' law and included in past trade deals negotiated under the George W. Bush administration. 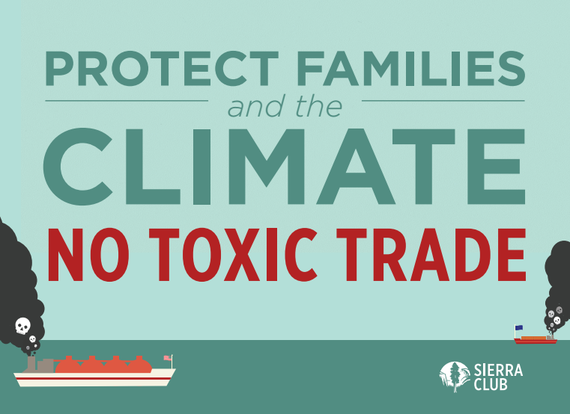 "Congress must stand up for American jobs, clean air and water, and a healthy climate by rejecting the toxic Trans-Pacific Partnership." "Now that the text of the Trans-Pacific-Partnership is available to the public, it is disappointingly clear that this is not the tougher language we had hoped for. The environment chapter is weak and fails to provide the necessary requirements and stronger penalties desperately needed to better fight poaching, protect wildlife habitat and shut down the illegal wildlife trade. The agreement also leaves our own domestic environmental laws vulnerable to legal challenge internationally, outside of our own judiciary system. "Most alarmingly, climate change isn't mentioned a single time in the environment chapter. It is ridiculous that in 2015, twelve of the world's nations would construct a trade deal of this magnitude and not even consider the effects of climate change on industries like agriculture or fishing, or ways to prevent worsening global warming through our own economic activities. Climate change is happening right now: Species are disappearing and extreme weather events like hurricanes, crippling drought and wildfires are become more prevalent across the world. Yet this trade agreement won't even acknowledge it. "Although presented as a groundbreaking trade agreement in regards to wildlife, the Trans-Pacific Partnership includes no commitments not already present in existing international and regional agreements for regulating wildlife trade or preventing wildlife trafficking. It includes no provisions for fighting climate change. We urge Congress to reject the Trans-Pacific Partnership and call for a plan that would actually make a difference for wildlife and our natural heritage." "This trade agreement would allow foreign corporations to challenge our health, safety and environmental protections in a foreign tribunal outside our legal system, and it would weaken those bedrock safeguards in the United States. While there are some positive conservation measures, the agreement's substantial shortcomings should lead Congress to reject it." "It's the first time that an FTA recognizes that it must support the global effort to shut down trade in stolen natural resources. Whether the TPP will actually do that, in practice, is an open question. EIA remains extremely concerned that the FTA as a whole will make it more difficult for countries around the world to effectively manage their resources and protect the global environment." "The TPP is an act of climate denial. While the text is full of handouts to the fossil fuel industry, it doesn't mention the words climate change once. The agreement would give fossil fuel companies the extraordinary ability to sue local governments that try and keep fossil fuels in the ground. If a province puts a moratorium on fracking, corporations can sue; if a community tries to stop a coal mine, corporations can overrule them. In short, these rules undermine countries' ability to do what scientists say is the single most important thing we can do to combat the climate crisis: keep fossil fuels in the ground. "The United States should be in the business of supporting the just transition to 100% renewable energy, not propping up the fossil fuel based economy of the past. While institutions across the planet are divesting from fossil fuels, the TPP would double down on the industry's destructive business model. The agreement works at absolute cross purposes to governments' attempts to reach a strong climate deal in Paris. As the world accelerates towards a clean energy future, the TPP is a dangerous detour that must be avoided." "Building inclusive economies for a better world requires people's participation and definitely not corporate manipulation. Locally, nationally, and globally, the people's movement to stop the fossil fuel industry that thrives in the same global economic order - favoring profits more than people-, is gaining momentum. The TPPA is a symptom of fear and desperation, a massive bid to overthrow any resistance people might throw at them. But people across all member parties, including non-member countries resist to be bound by the interest of corporate capitals." "It is a fact: TPP fails to protect the environment. This is true in spite of the White House's claim that TPP "includes the strongest commitments on labor and the environment of any trade agreement in history, and those commitments are enforceable, unlike in past agreements. "While past agreements have contained similar enforcement provisions for the environment chapter, no Party has ever brought a formal case based on the environmental provisions of any US free trade agreement--despite documented violations. In fact, the only provision related to the environment used with regularity is Investor-State Dispute Settlement (ISDS), which allows companies to sue governments for enacting and upholding environmental laws. "The history of US trade agreement enforcement--or lack thereof--shows that any minimal gains from new commitments on the environment under TPP pale in comparison to the negative human and environmental effects of its commercial and ISDS provisions. 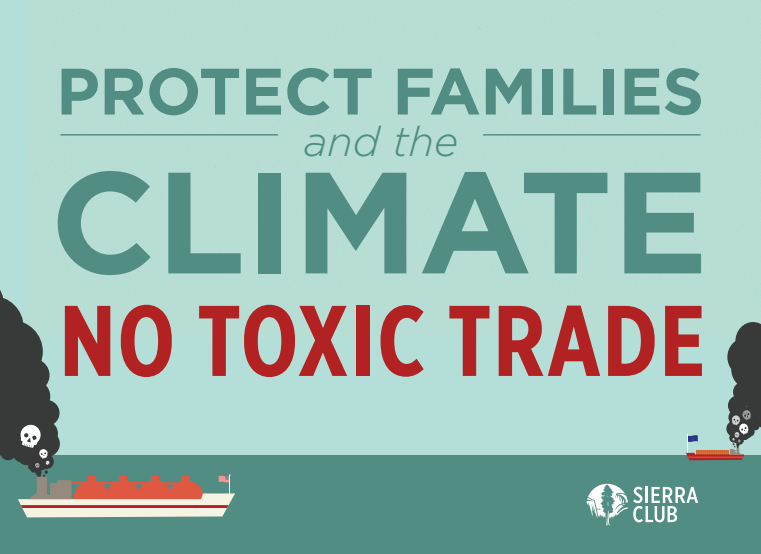 For the protection of people and the planet, Congress should reject this trade deal." "President Obama has sold the American people a false bill of goods. The Trans Pacific Partnership fails President Obama's pledge to make the TPP an environmentally sound trade agreement. Frankly this is not surprising; the text of this Trans Pacific trade deal was negotiated in secret by Mike Froman, the U.S. Trade Representative, a former Citibank executive and Obama fundraiser. Froman took care of his friends on Wall Street and in corporate board rooms at the expense of sound environmental and climate policy. Congress must reject the TPP deal." "As should be expected from any secretive negotiating process, the TPP text released by the White House today makes clear that this agreement is a threat to communities and the environment, and should be rejected by Congress when it comes up for a vote. "The text includes toothless ocean conservation provisions with slippery language that encourages but does not require bans on trade in illegal timber, shark finning, commercial whaling and illegal, unreported and unregulated (IUU) fishing. There are better ways to protect the world's oceans than what's in the TPP. "The treaty ultimately fails the laugh test: It doesn't reference climate change at all, while enshrining new legal means -- including investor-state dispute settlement (ISDS) provisions -- that would give corporate polluters the right to directly challenge state and federal regulations. It would also accelerate the climate crisis by facilitating the build-out of new liquid natural gas (LNG) export terminals. More LNG trade means more fracking for natural gas and more emissions of methane, a greenhouse gas 85 times more powerful than CO2. By introducing this treaty on the cusp of the Paris climate summit, President Obama has contradicted his own stated commitments to do everything in his power to solve the climate crisis." "The TPP is a giveaway to big agribusiness and food companies that want to use trade deals to attack sensible food safety rules, weaken the inspection of imported food and block efforts to strengthen U.S. food safety standards. The food and agribusiness industries inserted language into the text of the TPP that will undermine U.S. food safety oversight and expose consumers to risky imported foods. "The TPP will increase the volume of imported and potentially risky foods coming into the United States, but tie the hands of the border inspectors who are the last line of defense between the shipper and the supermarket. The TPP gives companies new powers to second guess inspectors and push uninspected food onto the market. "American consumers are pushing to block the use of artificial and potentially risky processes and ingredients, like antibiotics and GMOs, but the TPP could trump these democratic efforts to improve our food supply. "The TPP gives the food industry a powerful new weapon to wield against the nationwide movement to label GMO foods. The language in the TPP is more powerful and expansive than other trade deals that have already been used to weaken or eliminate dolphin safe tuna and country of origin labels. "The TPP food safety and labeling provisions are worse than expected and bad news for American consumers and farmers. Congress must reject this raw deal that handcuffs food safety inspectors and exposes everyone to a rising tide of unsafe imported food." "Nobody can call the TPP a win for the environment with a straight face. The text doesn't even mention the words 'climate change,' and the deal would require the US Department of Energy to rubber-stamp exports of natural gas, at the very moment we need to keep fossil fuels in the ground to avoid the worst impacts of climate change." "The final TPP text confirms what we all suspected based on the process, the TPP is a handout to corporate interests and a sellout of "we the people." The TPP would give new rights to foreign fossil fuel companies to challenge hard fought U.S. environmental and climate policies and gives U.S. corporations the right to do the same abroad. "Particularly worrisome are the TPP's provisions regarding natural gas. The TPP would require the U.S. to automatically rubber stamp all exports of liquified natural gas to every company that is a party to the TPP. This would accelerate the rate of natural gas exploration, extraction, and consumption, which is already having devastating impacts to our communities and our climate, and lock-in reliance on natural gas in countries around the world at a time when we need to be rapidly transitioning away from using fossil fuels and phasing out fossil fuel infrastructure. "We have no ground to lose in the climate fight. At a time when every policy we propose must be moving us forward towards a just and livable future, the TPP moves us back." "We continue to emphasize that the TPP is the wrong model; it's a belching Model T in an era of clean energy and new opportunities. The TPP is not acceptable because it promotes unsustainable and unhealthy trade in a number of goods and services, doesn't take climate change into consideration, and facilitates a massive increase in toxic natural gas exports when we should be keeping fossil fuels in the ground." "The long awaited public release of the text of the Trans-Pacific Partnership confirms our concerns that this deal will be a race to the bottom on regulatory standards intended to protect people, the environment, and our food system. The United States Trade Representatives have negotiated a deal that benefits the top polluters in this country while failing to institute any meaningful commitments to mitigate climate change. The deal will increase exports of liquefied natural gas and fracking in the U.S. At a time when the impact of climate change on the environment and communities worldwide is growing more evident, it is irresponsible for Congress to consider an agreement that does not place climate change mitigation at the forefront. The deal does not even mention the phrase 'climate change'. It is greatly disappointing that this deal so clearly puts at risk decades of environmental progress and disrupts the democratic process in order to secure corporate profits. This deal promotes an unsustainable system of industrial agriculture dependent on genetically engineered crops and chemical inputs, impeding national food sovereignty and local food security. TPP fails to create any real benefits for the American people and allows for increased manufacturing in countries where many workers already toil in sweatshops and enforcement of the law is weak. Past trade agreements have demonstrated the provisions for workers' rights are rarely enforced. The future and health of our people and planet should not be based on the greed of the most irresponsible corporations. It is imperative that Congress stand up for the environment and the democratic process and reject the TPP." "The released TPP text directly undermines the Obama administration's constant refrain of "Act on Climate." The TPP does not require partner countries to uphold international environmental law, including the upcoming Paris climate agreement. Furthermore, the TPP would double the number of corporations empowered to challenge existing climate policies at all levels of government. Congress must reject the TPP and work for trade agreements that ensure a stable climate and a just transition to 100% renewable energy."